WCI Realty Teams up with Rochester/ Monroe Blue Star Mothers Chapter #8 for a fundraising event to collect items for care packages to send overseas to our deployed military personnel. On May 20th WCI Realty will team up with Rochester / Monroe Blue Star Mothers Chapter #8 to launch Operation: Blue Star. This fundraiser will collect items and funds for our deployed man & women overseas. The donations will allow WCI Realty to create care packages and to send the troops a piece of home while they are deployed overseas serving the USA. Operation: Blue Star will run from Friday May 20rth until Flag Day, Tuesday June 14th. To participate you can drop off non-perishable items to WCI Realty’s main office located at 2450 West Ridge Rd Rochester, NY 14626 Monday-Friday between 8am and 5pm. For a complete list of items needed by our deployed troops please visit http://goo.gl/yWumzG or if you would prefer to donate money visit Razoo.com/us/story/Blue-Star-Mothers-Of-America-284. Rochester / Monroe Blue Star Mothers Chapter #8 was founded on April 16, 2011. The Blue Star Mothers of America is a Congressionally-chartered, non-partisan, not-for-profit organization formed for the purpose of supporting America’s military, veterans, and their families, and to foster patriotism. Blue Star Mothers sent nearly 1000 pounds of personal care items, snacks and valentine wishes to deployed troops in the Pacific, Afghanistan and a hospital in Kosovo this year. In total, there are 255,065 US military personnel deployed Worldwide. This is why WCI Realty would like to community to come together for this event and raise funds and awareness for this local charitable organization. WCI Realty is a local real estate brokerage located in Greece, NY, with close ties to the community. Not only servicing the community through real estate ventures Broker/Owner Anthony Butera and Brett Waterman along with other WCI Realty Salespersons are affiliated with many local charitable organizations. 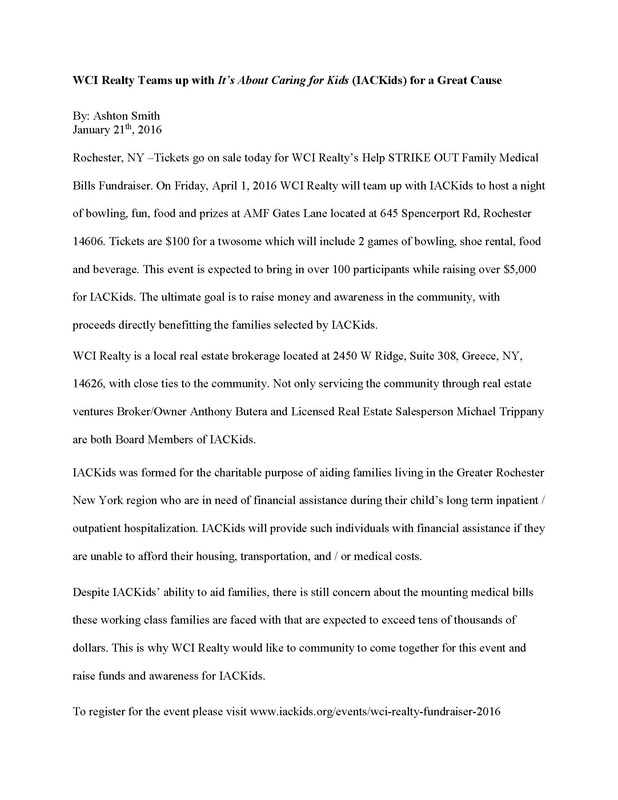 WCI Realty is committed to giving back to the Greater Rochester Community and has dedicated time and resources to help raise awareness for charities and foundations within the community. As detailed in the release , we are hosting a night of bowling to raise money for the IACKids non-for profit foundation which will secure more funds for local families. Should you wish to speak an Owner at WCI Realty, Anthony Butera, Broker/Owner can be reached at (585) 303-7450 or via email at buteraanthony@gmail.com or Brett Waterman (585) 202-4629 or via email brett@wcirealty.com.